ISLAMABAD (92 News) – The government has on Friday appointed former secretary finance Tariq Bajwa as the new governor of State Bank of Pakistan (SBP). Bajwa recently retired as the top bureaucrat at the finance ministry and had worked closely with Finance Minister Ishaq Dar, who has clashed with the central bank in recent days. 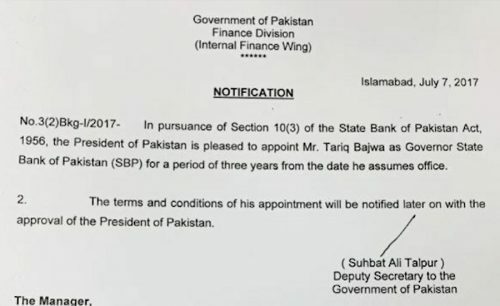 “The President of Pakistan is pleased to appoint Tariq Bajwa as Governor State Bank of Pakistan (SBP) for a period of three years from the date he assumes office,” according to a statement posted on the official finance ministry Twitter feed. Bajwa’s appointment comes days after Dar sparred with the central bank over the rupee’s unexpected 3.1 percent plunge against the dollar on Wednesday. Analysts said the central bank allowed the local currency to fall, which prompted a furious backlash from Dar. Deputy Governor Riaz Riazuddin was in May appointed as acting governor for three months until a permanent new chief was named. But Dar said the appointment would be brought forward after the rupee plunge. Riazuddin is expected to revert to his post as the deputy governor, according to an SBP source. Analysts have said Dar’s outspoken comments against the central bank had put in question the bank’s independence, and the appointment of a civil servant, rather than an economist, is likely to add to doubts about the bank’s autonomy.